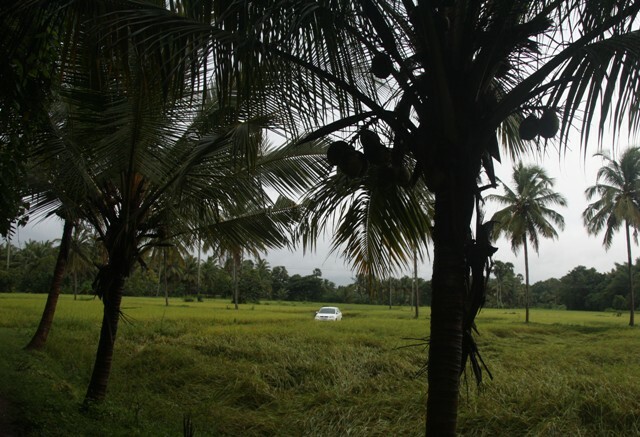 The writer waxes on his experience of staying in a traditional farm house, Sree Chithrakoodam at Chittur, 10 kilometers away from Palakkad town. He gets more than he asked and is pretty happy with that. When was the last time I spent a night here? 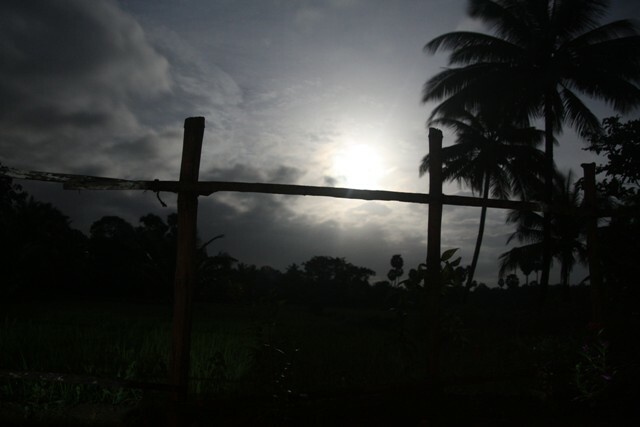 I sit on a wooden chair in a mud house right in the midst of a sprawling rice field. All around me the muffled green stalks doze lethargically beneath a white blanket which the moon drapes them with. Did I hear the howl of a fox from the distance a minute back? Was that the cry of a peacock which suddenly paused as if it was startled picking up the scent of the beast? If silence is golden I know what diamond is. It is a night which erupts into a thousand frogs croaking in different platitudes just after a downpour. I am engulfed by it. The rain is unrelenting. See how she comes in pussyfoot, pitter-patter on the roof to wake me up from my reverie and at last slips out wounded when I pretend not listening. When was the last time I spent a night in this mud house, I must think hard. Nights like this are notorious. They evoke tangled memories of many other nights too. Some real. Some fictitious. Sad nights. Sweet nights. Romantic nights. Nostalgic nights. Nights when I lay on the bed with open eyes and an overflowing heart dreaming about the journey I’d set about at sunup. What a depth this one night has! Until half an hour ago we were talking with my hosts Sivasundaram and his wife Lekha about the wonders of this place, its culture, its people. I had never seen my daughter sit with her ears all pricked up to tales so late into night. No body wanted to pull off this magic and retire to bed. No body was content with the chat under these magical golden bulbs, and the ochre walls that keep the rain, the fields and a prying moon at bay. My wife, otherwise reticent was meeting Sivan chettan and Lekha chechi for the first time in her life; but how comfortable she was, as she chatted happily as if they are her close relatives (And this homeliness is what which calls you again and again to the house they have painfully built with mud and oodles of love they share). Nights like this must be snipped and pickled and carried home to be savoured whenever we get too cloyed with sweetness which numbs the senses. A sniff into such kept nights will evoke all the philosophy in you to slow down and ponder in life. 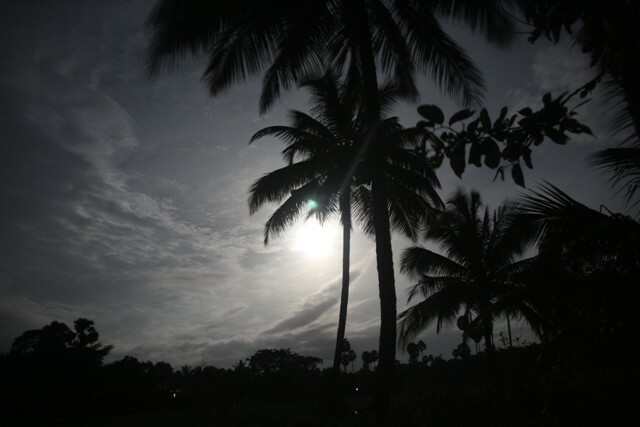 When was the last night I spent in Sree chithrakoodam in Chittur? No. I haven’t. Never. Sree Chithrakoodam was a happy accident, a chance discovery, a serendipity. The first on my priority list was the much publicized Olappamanna mana when I decided to spent a day in a traditional house in Palakkad. Then my eyes chanced upon a photograph of this home in a website. 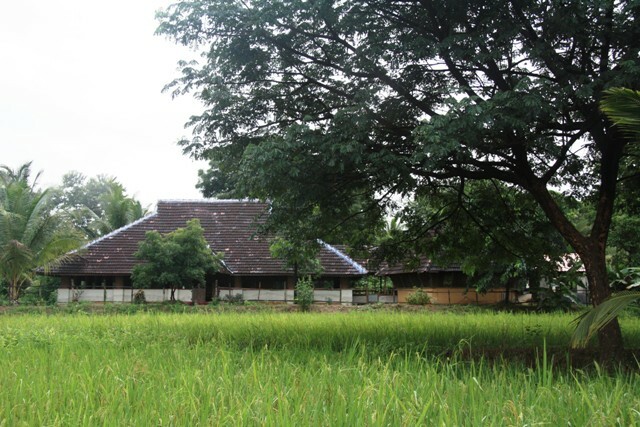 I liked the picture of the traditional home nestled in the midst of a green frame made of rice stalks waiting. 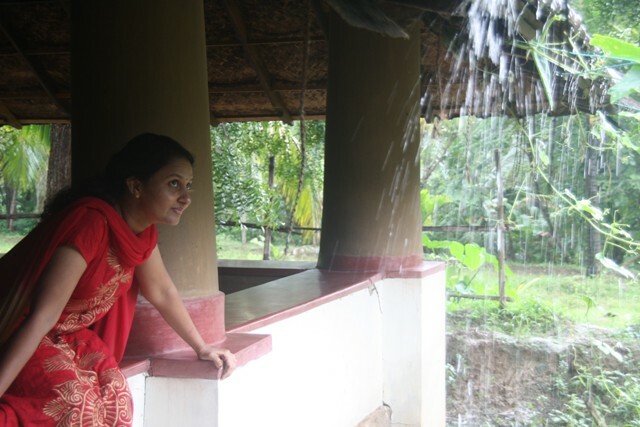 We were picked from Chittur junction (10 kms from Palakkad) by Sivan chettan, who runs the mud house. After a couple of kilometers chasing his bike I was asked to bungee-jump my ford fiesta off the road and down into a rice field far below. The car screeched into a halt. No way. Let’s kill the dream of staying in a mud house. I baulked. I am going back to my normal world, I decided. Then my eyes picked a crude track dipping down from the road, piercing through the fluorescent green field until it teetered into a far away home, large and beautiful, buoying up on a sea of green stalks. There is a nest of a little sparrow hanging at the entrance to welcome the guests. “Manu chetta, this is your ideal home you tell me about, alle?” Divya was all excited. I nodded. It is as if somebody had sneaked into my mind, plucked my dream home and built one after it. See those pillars all around the house. See the parapet that follows where one can sit sluggishly all through his old age and smirk at lives in the fast line where you once had been. Yes, this is where I promised you to take you dear, when we are really really old, I smiled. The moment you enter the house, the ochre walls, made of mud will immediately ask you to lower your defenses and relax. Be at home they whispered. Outside, the fields were blazing in a fiery noon. Then suddenly clouds surged in from nowhere bringing the showers to welcome us. you really took me to the mud house..